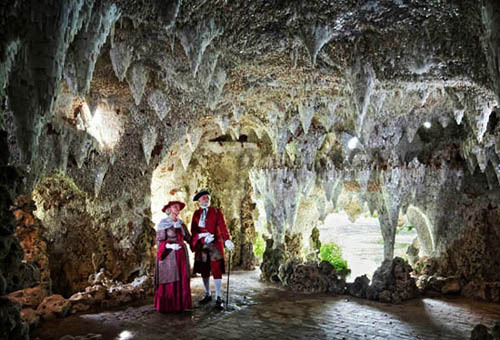 Great Grottoes get good grading - Painshill Grotto. Do you have a favourite grotto that you think should be added to the Grotto.Directory or you would like graded? We would be delighted to hear from you and plan a visit to view the creation of your choice. We can also offer advice and suggestions, should you be interested in upgrading or restoring your grotto, or even constructing your own domestic grotto using crystals and shells. Our Minstrels of Mythology, who carry out the site visits, are experienced mature grotto enthusiasts and are delighted to work alongside you in furthering your own wishes. Our Minstrels work on an honorary basis, seeking no reward for their advice other than the satisfaction of knowing that it furthers the cause of the mythological grotto landscape feature. Do you visit grottoes in the North of England? If so perhaps you would like to join our team of Grotto Graders? Do contact us at the Fellowship address below.